All Inclusive Meal are included. 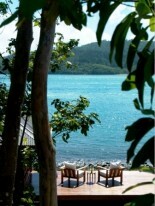 Qualia is located on the breathtakingly beautiful northern most point of Hamilton Island, Queensland, Australia. Hamilton Island has its own jet airport and is service by Australian carriers from all major east coast cities and can be reach in a two to three hour non stop flight. The airport can accommodate private aircraft and there a daily ferries from Airlie Beach on mainland Australia. 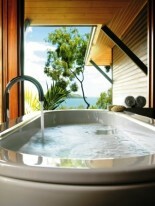 Qualia is situated on Hamilton Island in the heart of the Great Barrier Reef, Queensland, Australia. Opening in September 2007, it is the Whitsundays most exclusive and luxurious hotel. Each one bedroom villa is private and freestanding with spectacular uninterrupted views of the Whitsunday waters. 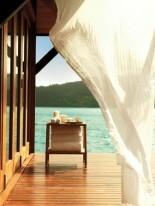 Qualia meaning “a collection of sensory experiences” will not disappoint the most seasoned traveler. The 60 villa, 5 star resort features two swimming pools, two private restaurants, a beautiful six room spa complete with Roman baths, a state of the art gym and yoga centre and all with spectacular views of the surrounding tropical waters. The Windward Pavilions are four times the size of a standard hotel room and feature their own private plunge pools. The Leeward Pavilions set in the tranquil tropical gardens of the resort will delight guests with their sense of space and meticulous design features. All Pavilions are surrounded by natural bush land as well as manicured gardens and offer their occupants total privacy from other guests and staff in the resort. An electric golf cart is provided with every Pavilion ensuring that guests are free to explore Hamilton Island at their leisure. 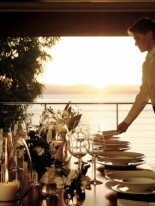 Qualia also offers an excellent choice of dining options. The elegant Long Pavilion restaurant and the Pebble Beach restaurant - a more casual space, will provide exceptional food and wine experiences. Fancy something more private? The resort staff can arrange intimate dining alternatives such as dinner on Qualia’s private beach or a private dining room in one of the restaurants. Qualia offers its guests exclusive use of a Gym (with access to a personal trainer) and Yoga centre. The resort has two swimming pools, a library, private dining rooms as well as two restaurants and a bar. The resort features its own day spa. “Spa Qualia” is a six room facility, with four single private rooms as well as two couples rooms complete with Roman Baths. Exclusive private beach visits as well as helicopter and sea plane trips to Whitehaven beach and the outer reef are just some of the activities that can be arranged. While staying at Qualia guests can also take advantage of all the other activities that Hamilton Island has to offer. Sailing, cruising, parasailing, bushwalking, fauna park tours as well as an extensive array of outdoor and indoor activities will ensure that your vacation can be as action packed as you choose it to be.